Is self-sabotage holding you back from taking action toward your success? Does your inner critic get in the way of your goals and dreams? 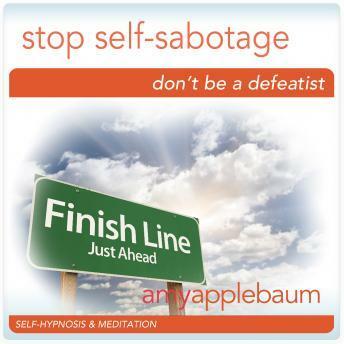 Nurture and support yourself and stop the self-sabotage now with "Stop Sabotaging Yourself" by Amy Applebaum. Amy is a world-renowned life and business coach, NLP trainer, Hypnotherapist and Time-line Therapist, whose success has led to high-profile appearances on such television outlets as ABC News, CNN, TLC, Dr. Drew's Lifechangers and Martha Stewart, to name a few. She also serves as an ongoing expert to publications including the NY Times, The International Herald Tribune, Cosmopolitan, Shape, Figure Magazine, and Woman's World. You deserve happiness and success, and hypnosis and meditation can help. Positive suggestions and binaural beats will be received by your mind, helping you remove self-doubt and negative self-beliefs, and replace them with positive thinking that supports the achievement of your goals. "Stop Sabotaging Yourself" will shift your beliefs about yourself in a positive way, filling you with empowering beliefs and motivating you to take action towards your goals and dreams. Don't let self-sabotage keep you from success. You are worthy of an amazing life. It's time to empower yourself today.